RBTH presents a selection of views from leading Russian media on international events, featuring analysis of amendments to the Ukrainian constitution that have led to rioting in Kiev, as well as growing tensions in the Arctic, and a report on rescue operations at a flooded zoo in the Russian Far East. 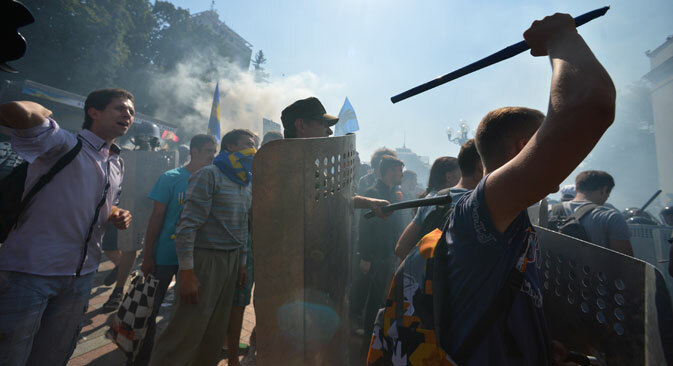 Attempts to storm the Ukrainian parliament in response to the adoption of an unpopular law, a killed National Guard soldier and dozens injured – Monday, Aug. 31 in Kiev smelled of a new phase of the Ukrainian turmoil, writes the online publication Vzglyad. The bone of contention was the amendments to the constitution on the decentralization of power, which Kiev has promised to make under the terms of the agreements signed in Minsk in February on settling the ongoing conflict between government forces and Russia-backed rebels in the Donbass region of eastern Ukraine. This sparked the indignation of ultra-radical nationalists, who accused Ukrainian President Petro Poroshenko and Prime Minister Arseniy Yatsenyuk of surrendering the Donbass. This accusation is pretty fair, the author of the article notes, but the adopted amendments do not have any serious impact either on the decision of the Donbass to return or not. Their value is purely propagandistic – Kiev needs to show the West that it is complying with the Minsk accords. Decentralization in its present form does not comply with the demands of the Donbass – and everyone understands that it will not lead to any reconciliation and all the more to reunification. The current Ukrainian government is not going to build any new Ukraine, the article alleges. It only wants to continue the movement toward the West, without Crimea and the Donbass, hoping to retain control of what is left. Constitutional reform and decentralization are needed only for the diplomatic game with the West and Russia – “see, we did everything, but the Donbass does not agree to return, so the U.S. and the EU should increase pressure on Russia and help to Kiev,” says the article. Against the background of the Ukrainian crisis, Arctic issues remain one of the few areas of practical cooperation between Russia and the West. However, this is also under threat, writes the business daily Kommersant. The leadership of the U.S. navy has accused Russia of building up its military presence in the Arctic. The Russian Foreign Ministry, in its turn, accuses the West of “attempting to bring elements of confrontation to the region.” Experts, however, hope that the Arctic will remain an area of cooperation, even if it is surrounded by an “atmosphere of rivalry and a cold war,” writes the newspaper. According to Dmitry Trenin, director of the Moscow Carnegie Center, the Arctic remains “primarily an area of cooperation” between Russia and the West. “Claims that the states put forward on certain areas of the continental shelf overlap only to a minor extent,” the expert told Kommersant. “Climate change and ice melting make the Arctic suitable for navigation. But it is also rather an area of cooperation – even if competition exists, it is commercial, not geopolitical,” he said. “There is no serious confrontation and arms race. Nor is there a sense that once again the fateful days when the future of the world hangs on a confrontation between Russia and the West have arrived,” he said. An operation continues to rescue animals from a flooded zoo in Russia’s far eastern city of Ussuriysk. Rescuers reached the animals, the news website Gazeta.ru reports. The animals are weak and emaciated, although the water in the zoo has already started to recede. So far, it has been decided to leave them in the cages, because some of the animals may not survive transportation and the anesthesia required for their evacuation. Locals are collecting honey and vodka for the bears, who have had to spend many hours standing on their hind legs up to their waist in water, the publication reports. “The bears are exhausted after two days of standing on their hind legs in the icy water. Many of them do not react to anything anymore. Some of them have bleeding feet,” said the volunteer center. The zoo was flooded on Aug. 30 after the river Rakovka burst its banks. Fourteen bears, one lion, three wolfdogs (a hybrid between a dog and a wolf), a wild jungle cat and two wild boars were trapped in their cages by the rising waters.